COP14 will review the progress in the implementation of the strategic plan for biodiversity 2011-2020 evaluating how far the governments have been able to fulfil Aichi Targets. The Conference will also further look in to post 2020 global pathways towards 2050 vision for biodiversity. The experience in India shows how countries continue to allow deforestation while pretending to restore forests with monoculture tree plantations, and how problematic the concept of offsetting and climate or land degradation “neutrality” are in this respect. India’s Fifth National Report to CBD 2014 reported on India’s progress towards Aichi biodiversity target 5. The report mentions Green India Mission (GIM), a climate action plan to increase “forest/tree cover on 5 m ha of forest/non-forest lands and improved quality of forest cover on another 5 m ha of non-forest/forest lands”. If we look at this greening programme that is in progress across the states, it looks like a massive plantation drive of monocultures. Afforestation and reforestation is advocated in all the State Action Plans (SAPCCs) through implementing, promoting and dovetailing of Green India Mission (GIM) and National Afforestation Programme. Most of the SAPCCs take GIM as a guidance to increase forest cover, both inside and outside forest areas including promotion of industrial and energy plantations, CDM possibilities and the REDD+ in the context of Sustainable Forest Management. The main thrust is ‘on the improvement of forest trees and productivity of forests… species exotic to the country are being introduced and propagated in suitable environment and particularly where indigenous species fail to thrive’. While GIM is on, a look at the loss of forests in India between 1980 and 2015 shows little or no progress towards achieving Aichi Target 5. The Forest Survey of India 2015 says that total forest area increased by 3,775 sq. km since 2013. In the same period, 2,511 sq. km of very dense and mid-dense forests were completely wiped out. The government’s reply to a Parliament question indicates that between October 1980 and July 2016, India has diverted almost 900,000 hectares of forest land for non-forest purposes. This amounts to 1.2% of India’s total forest area as of 2015. Interestingly, the Ministry of Environment, Forests and Climate Change (MoEFCC) pegs diverted forest land much higher. According to MoEFCC figures, forest land diverted during this period stands at 1.49 million hectares, which is 1.9% of total forest area in 2015. It is clear that even though India’s National Reporting talks of increased forest and tree cover, restoration and improved quality of forest cover, massive deforestation is continuing. If cutting down natural forests continues at this rate, replacing them with plantations does not serve the purpose of achieving Target 5. 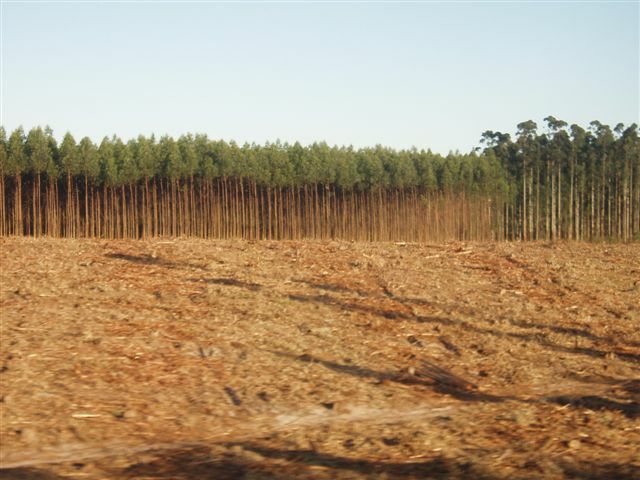 Allowing destructive industries to “mainstream” biodiversity through offsetting and promoting concepts like climate or land degradation “neutralilty” only provides an excuse to replace precious forests with monocultures, with devastating consequences for biodiversity and our chances to comply with Aichi Target 5 and SDG 15.2. The focus, therefore, has largely been on afforestation and the State Forest Departments are familiar with only routine afforestation programmes, largely dominated by the monoculture species, including eucalyptus, Acacia auriculiformis, teak (Tectona grandis), sal (Shorea robusta), pines, poplar, Acacia tortilis, etc. While GIM is on, a look at the loss of forests in India between 1980 and 2015 shows little or no progress towards achieving Aichi Target 5. The Forest Survey of India 2015 says that total forest area increased by 3,775 sq. km since 2013. In the same period, 2,511 sq. km of very dense and mid-dense forests were completely wiped out. The government’s reply to a Parliament question indicates that between October 1980 and July 2016, India diverted almost 900,000 hectares of forest land for non-forest purposes. This amounts to 1.2% of India’s total forest area as of 2015. Interestingly, the Ministry of Environment, Forests and Climate Change (MoEFCC) pegs diverted forest land much higher. According to MoEFCC figures, forest land diverted during this period stands at 1.49 million hectares, which is 1.9% of total forest area in 2015.